· There are over 20,000 species of fish inhabiting the salt or fresh waters of the world. · In the 16th Century Chang Chi-en-te wrote the first book on keeping fish 'The Book of the Vermilion'. · Fish swim by contracting bands of muscles in sequence on alternating sides of the body so that the tail moves rapidly from side to side. Fins are used mainly for stabilisation. · Fish breathe in oxygen, not air. As water passes over a system of fine gill membranes the oxygen is absorbed. Gills contain a network of fine blood vessels that take up the oxygen and diffuse it through the membranes. · Fish would suffocate if they tried to chew their food as it would interfere with the passage of water over the gills. Carnivorous fish (sharks) have sharp teeth which they use to seize and hold their prey but swallow it whole or in large pieces. Herbivorous fish often have tooth-like grinding mills in their throat. 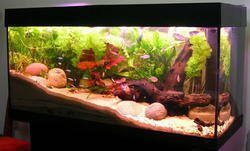 · It is believed that most fish are colour-blind but they can see colour shadings, reflected light, shape, and movement. · The oldest goldfish in the world is thought to be "Freda" who died in Sussex, England in 1980 aged 41 years. In China, the country of origin for goldfish, they have also been reported as living for over 40 years. · The most famous goldfish on record is probably a Black Moor named "Miss Liberty" which toured the USA during the First World War promoting the sale of Liberty Bonds. · The most travelled goldfish on record was named "Fish". He was purchased in Japan in 1977 and spent the next 3 years on board a merchant ship where he logged up 432,329kms.